I’m still not sure how my blog compares to other blogs but, as I’m averaging nearly 1000 views a day, I definitely feel it is worth continuing. Even though many of my posts don’t get many views, because there are over 700 posts and some of them do fairly well, the total views continue to increase. 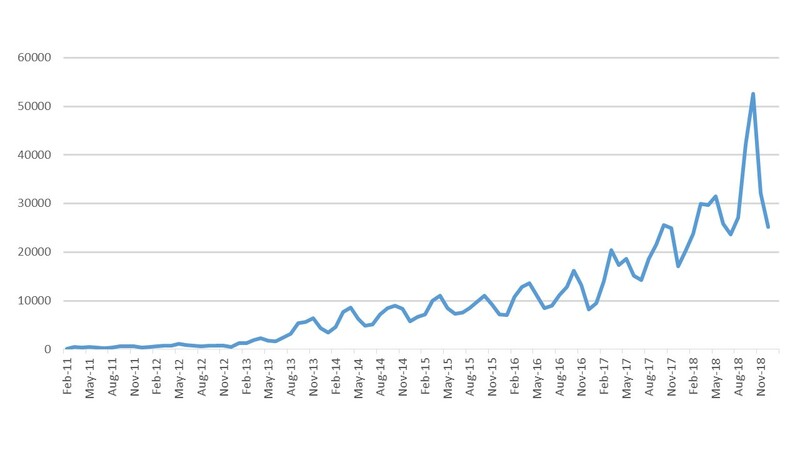 As can be seen in the above graph, December/January and June/July are much quieter months which suggests to me that quite a lot of students use the blog. I found it hard to make time for the blog in 2018—I only posted 21 times. Part of the reason is because work at the Family Action Centre is taking more of my free time, but I have also been struggling with motivation and a sense of inadequacy. Hopefully I will get back to more regular blogging in 2019. I don’t make any money from the blog, and don’t want to. The following stats are based on those available through a free WordPress blog (with the “no ads” upgrade). As you can see it isn’t a blog the has much interaction. I’m happy to have more, but I don’t actively try to create a “community” connected to my blog. It is more about providing information and resources. The following are the top posts for 2018. As you can see, some of them were written a few years ago but continue to be relevant. It is a bit disappointing that my top post, was not about the main issues I write about (strengths-based approaches to working with communities and families, and environmental sustainability). It could be tempting to chase views by writing similar posts but, as I am clear about why I blog, I don’t intend to change my focus. In the next post, I’ll list all the posts I wrote in 2018 with how many views they’ve had. Graeme, I’d like to hear your thoughts on how to start change in the fashion industry; given it is one of the largest polluters. I’ve done a post about why fast fashion is a problem . I’ll follow it up before too long with what we can do about it. Thanks for the suggestion!